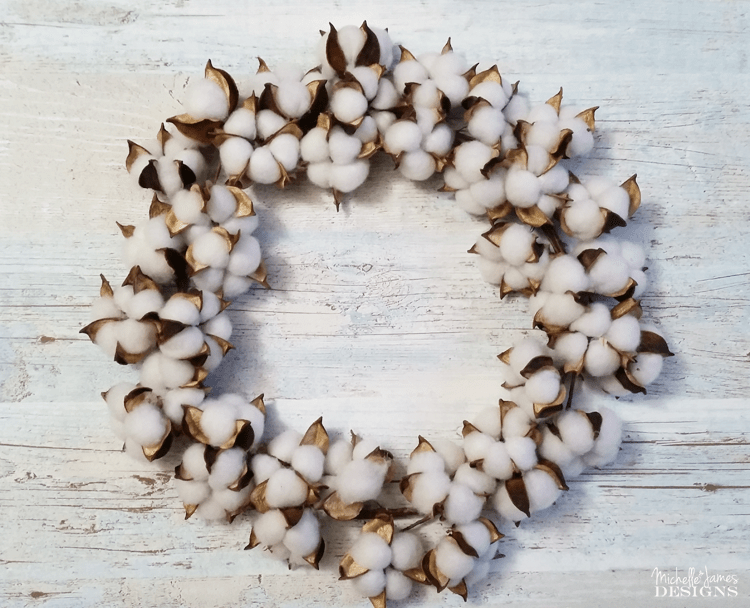 I have been wanting a cotton wreath for some time now. They have become popular since Chip and Joanna Gaines, from the HGTV show Fixer Upper, brought the farmhouse look into the public eye. They decorate with pretty, white ship lap and add a mix of rustic metal, wood, and greenery to create the perfect decorated room. I just love it. I have once again teamed up with Oriental Trading for this post. 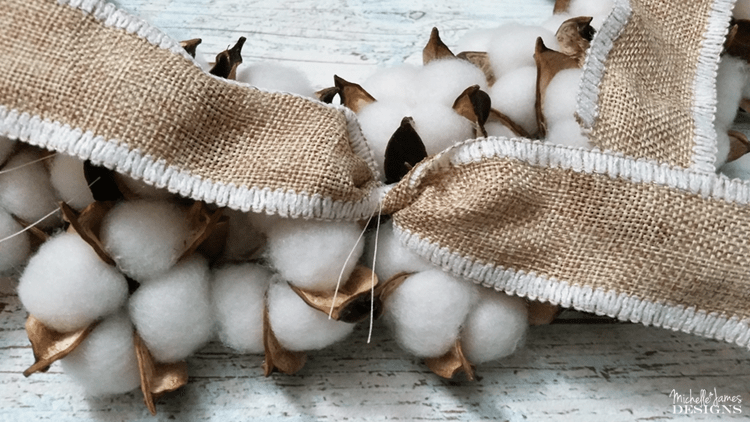 Can you believe this cotton wreath is from them? 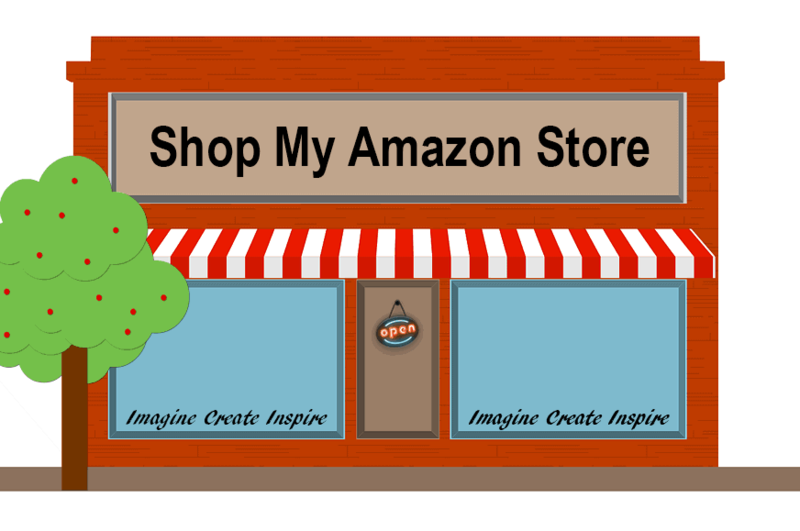 I am telling you they have stepped up their game and have added some great products for home decor and crafts. This is one of my favorites. If you haven’t been to their site in a while check them out. Some of the things I like to search are the mason jar items. 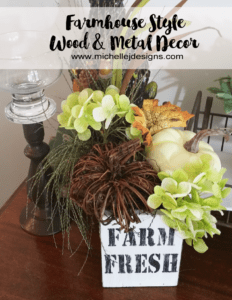 They have the different lids that can help to hold flowers up or even hold a picture as well as other fun glass farmhouse products. Or I like metal items. 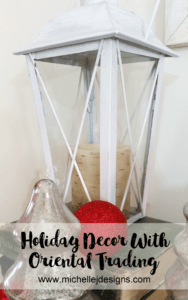 There are some fun lanterns and don’t forget my awesome metal ornaments I had out during the holidays. 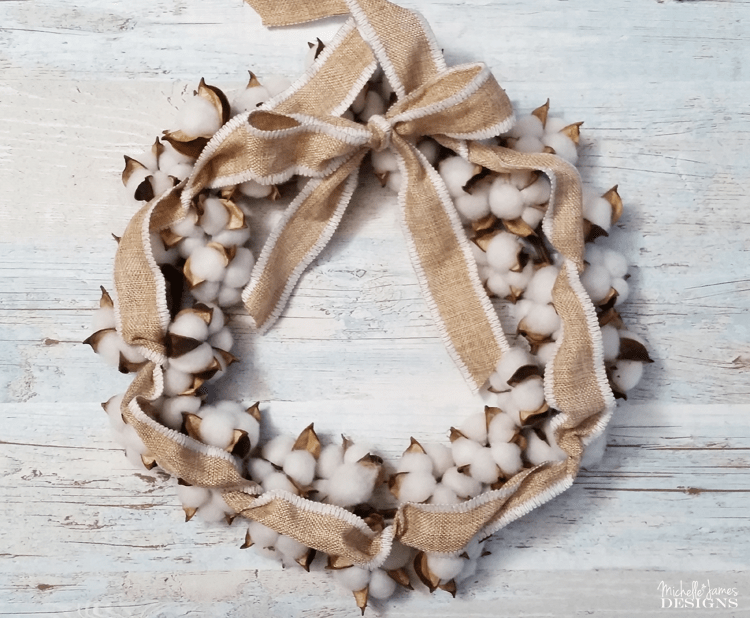 You know that I love the farmhouse look and these wreaths are super popular. 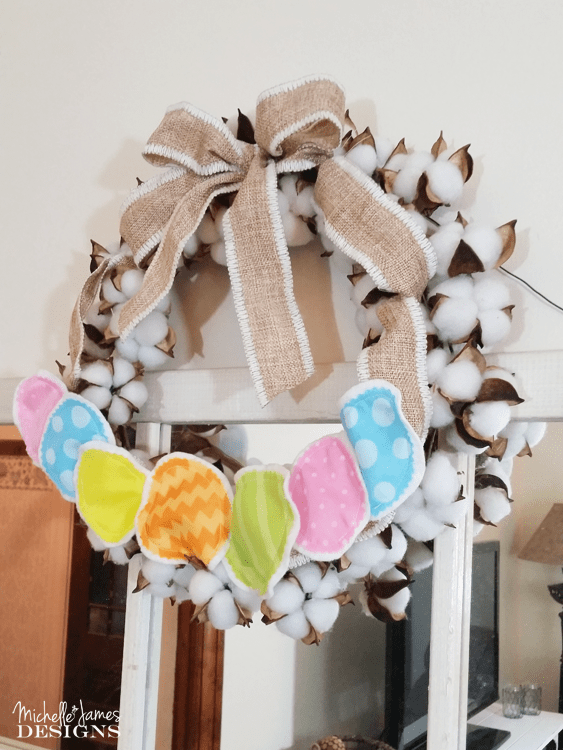 I have made the Easter decor temporary on this cotton wreath so I can take it right back to it’s original form when Easter is over. 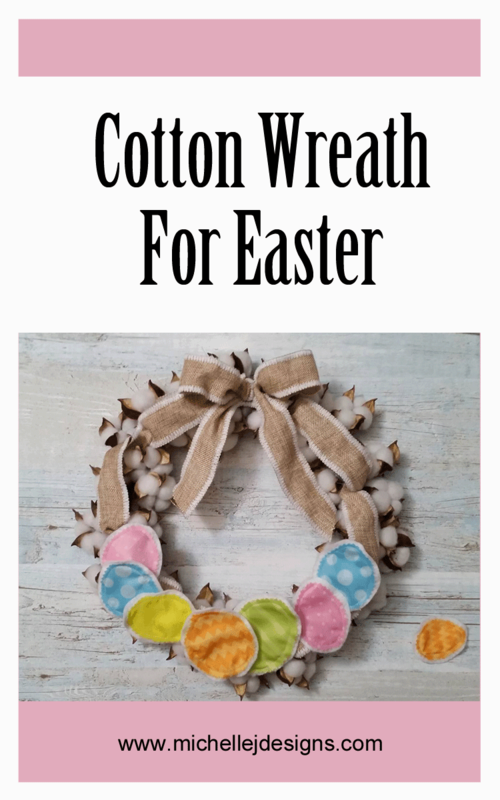 Here is what you need to complete an Easter cotton wreath of your own. 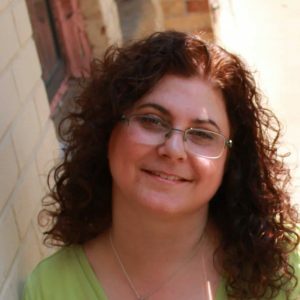 I have included some affiliate links for your convenience. You can read my full disclosure here. 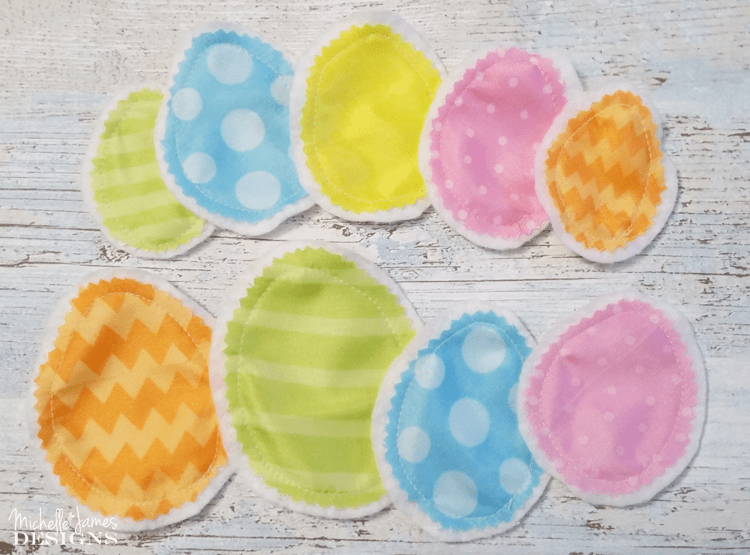 Easter Print Bandanas or Easter Egg fabric (I ordered the Easter Print Bandanas from Oriental Trading but they are out of stock right now. You can search for them on the site and when they are back in they will show in the search. 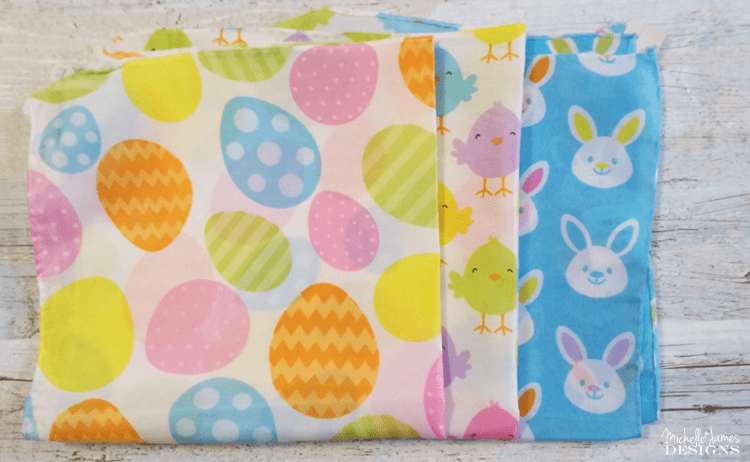 These are the Easter Print Bandanas. Aren’t they cute. 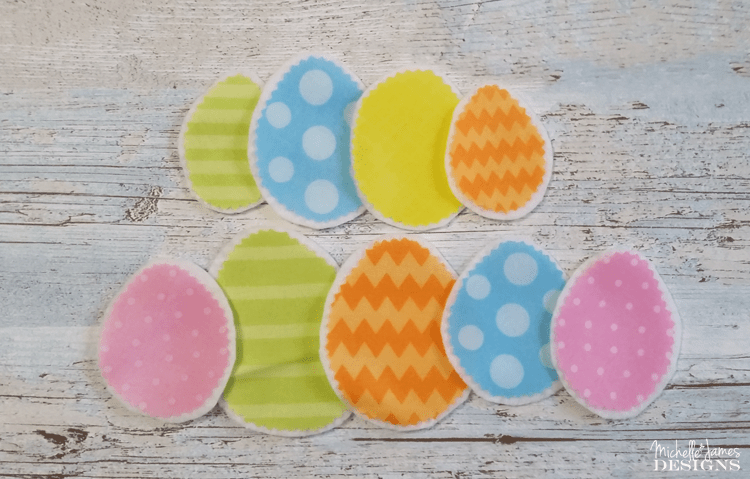 I am having fun using these as fabric to make other Easter Decor. I am working on a table runner that I hope to show you soon. For the cotton wreath I used the egg bandana and cut out several different colors using the pinking shears so they would not ravel. I also cut out a piece of cotton batting to go behind each of the eggs. I made them a little larger than the egg so the batting would show. Using the sewing machine I stitched the eggs to the batting. 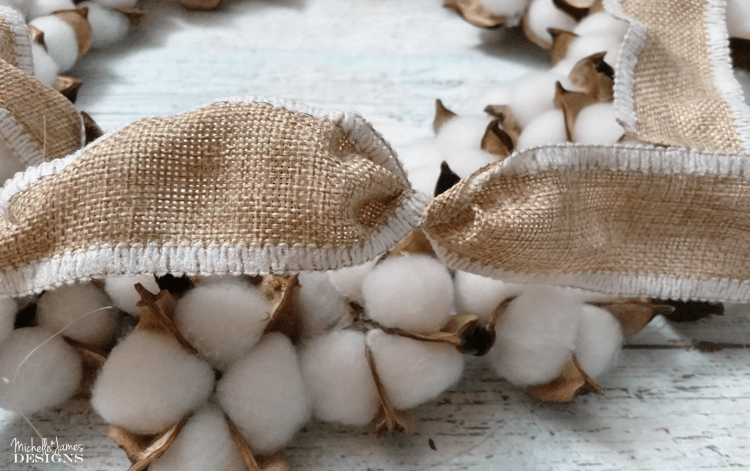 Adding everything to the cotton wreath is the next step. 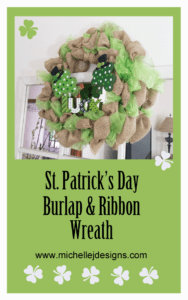 We start with the plain wreath. Then add the ribbon and the bow. I laid the ribbon around the wreath in “waves”. This means I pinched the ribbon in places around the wreath to form a nice pattern of ribbon. When I liked the way it looked, I twisted the ribbon. Then tied it onto the wreath with thread at each twist. I did this at every twisted spot until it was all secured to the cotton wreath. Then I tied the bow onto the top to hide where the two ends of ribbon meet. I liked the look of this too but still wanted to add the Easter frills! Using the fabri-tac to glue the eggs onto the ribbon and to each other. I did not glue them to the wreath itself. 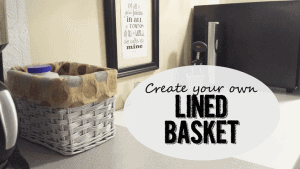 Adding wreaths is the perfect solution for this space. They hide the wires that holds the mirror up perfectly. 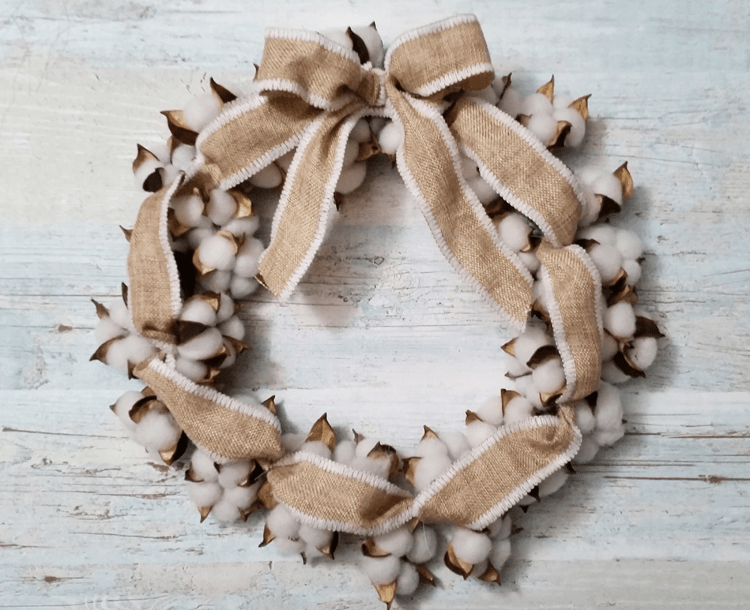 This cotton wreath could be a little bit larger but I love it just the same. There are two more items on this table from Oriental Trading. 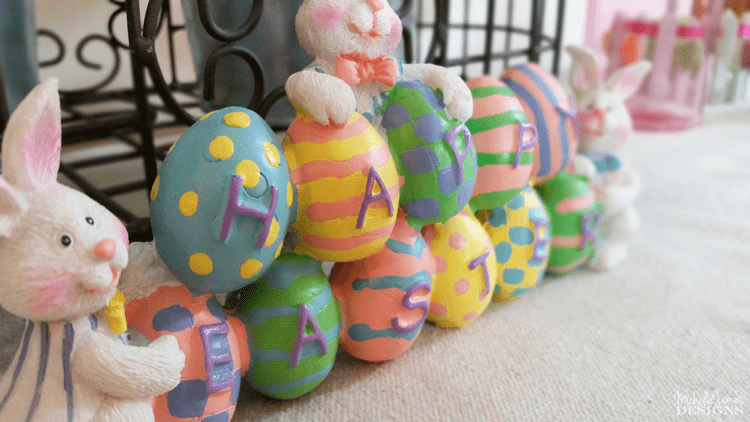 If you are not a DIY’er these Easter items are perfect. I did not have to do anything to them. 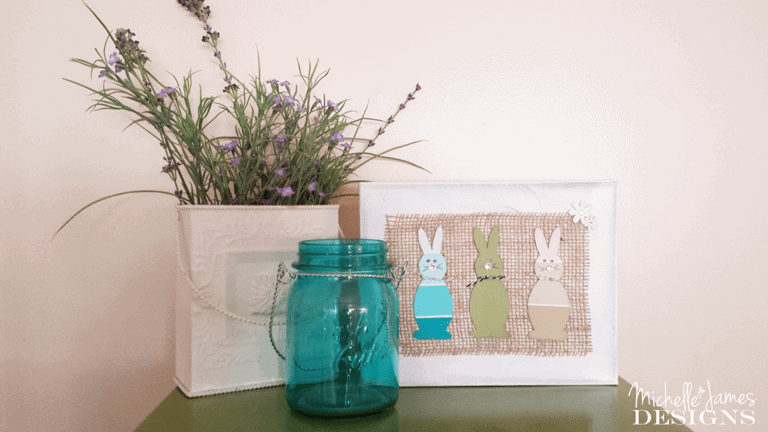 The first is the Happy Easter bunny decor. This close up photo shows the bright colors and hand painted look. 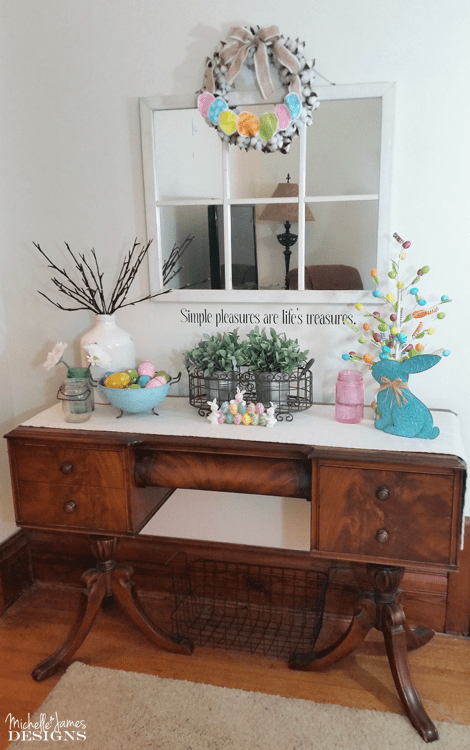 It really brings my Easter vignette together. The colors match everything I have done here to it makes me happy to just set it in front and let it set the Easter tone. I love this tree. It was the first items I picked from the Easter items. The sparkles and the colors are too fun. Can you see the sparkles? I just love it. And, SO FAR the cats have not bothered any of it. Well, one day when we came downstairs in the morning the teal, tin bunny from Dollar General was on the floor. We are not sure which kitty was the culprit but we have a good idea. Chloe was the first down that morning with us and she approached the tin bunny very slowly and cautiously. Who knows it may jump up and attack her. She slowly got past it then ran to the kitchen for safety as fast as she could. LOL! Cats are funny. They have been really good about the decor and I am lucky. Some cats, namely my friend Peggy’s cat Spike, would probably have destroyed the entire thing by now. He loves to check things out then proceed to play like a kitten! It is funny….but not funny at the same time. Poor Peggy she can’t have nice things out just for decoration. They usually become a Spike toy. I hope you like my Easter display. 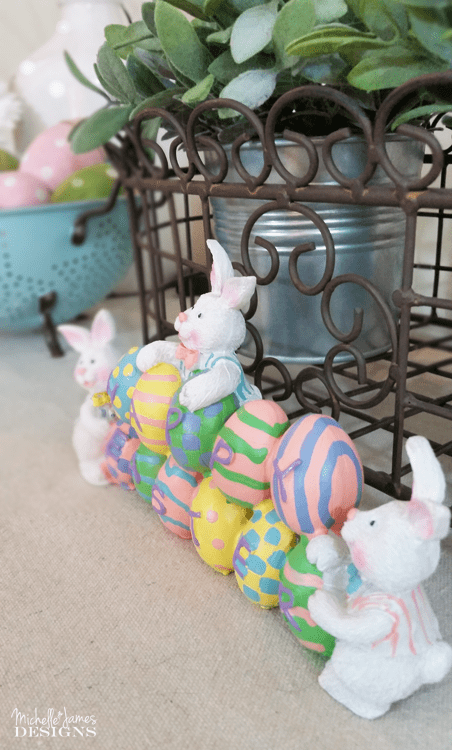 Don’t forget I am not quite done with Easter yet and will be showing you my table runner as I mentioned before and there could be a few other surprises as well. Who knows. 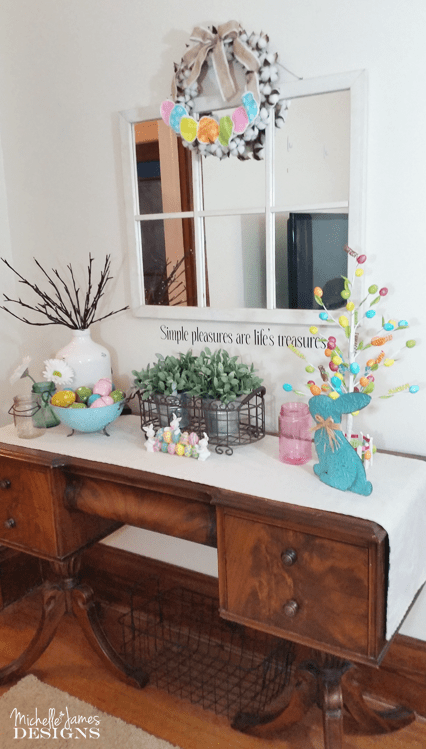 After Easter I will remove the Eggs and make it into genuine farmhouse decor! Won’t that be fun? I hope you will stop back to see it. In the mean time thanks for stopping by and have a great day! 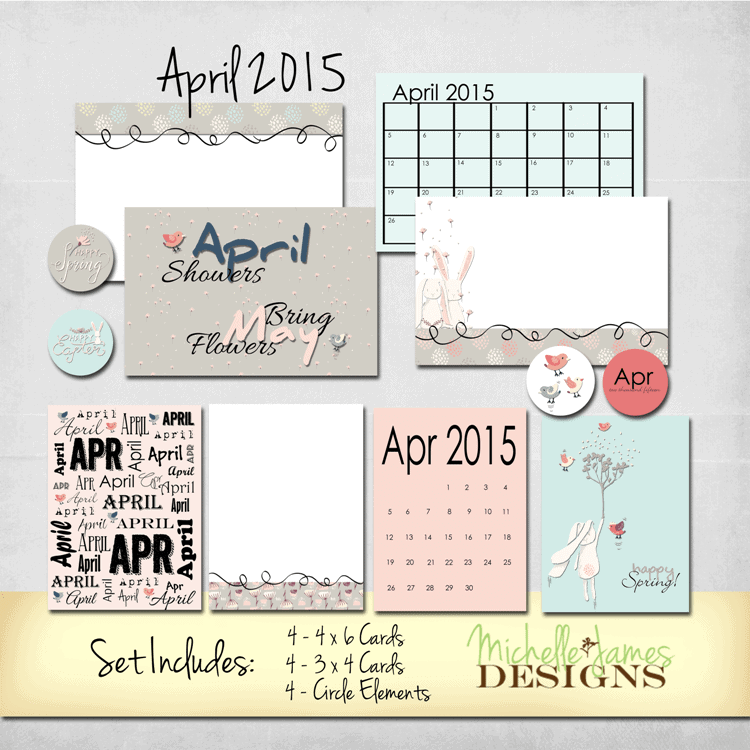 This is for 2015 but the little cards are so cute to print and use for cards or Spring/Easter Decor! Poor Spike. He is just trying to play and he is misunderstood! LOL! The tree would be a goner at your house. 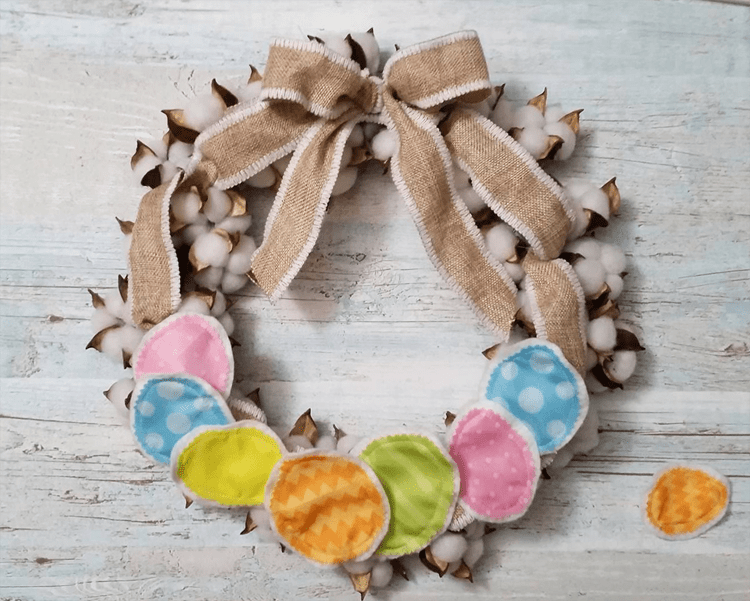 YAY – I love the wreath and how you twisted the ribbon and sewed the darling eggs for the wreath. 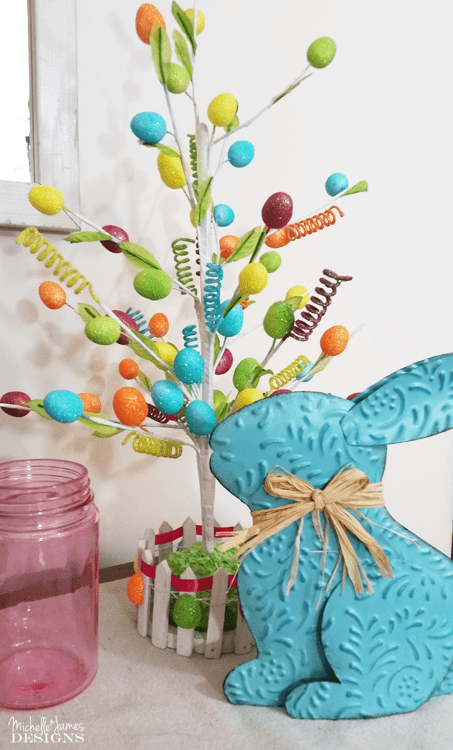 I love Easter trees so I was happy to see yours. 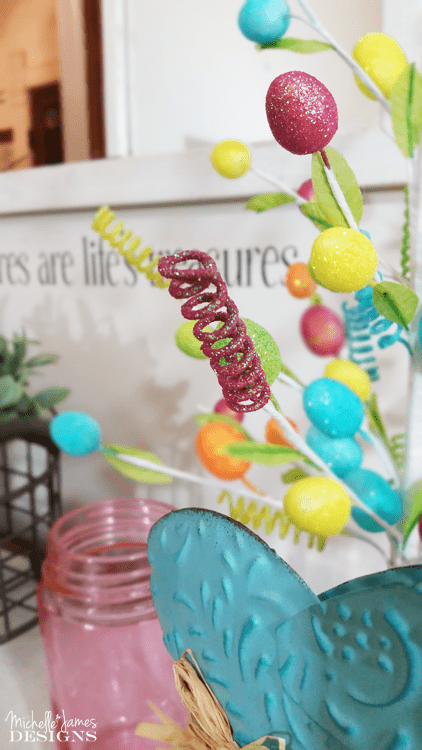 My Mom used to spray paint real branches white and then put jelly beans on the branches. Your mom sounds like she was so crafty. You must have learned a lot from her. 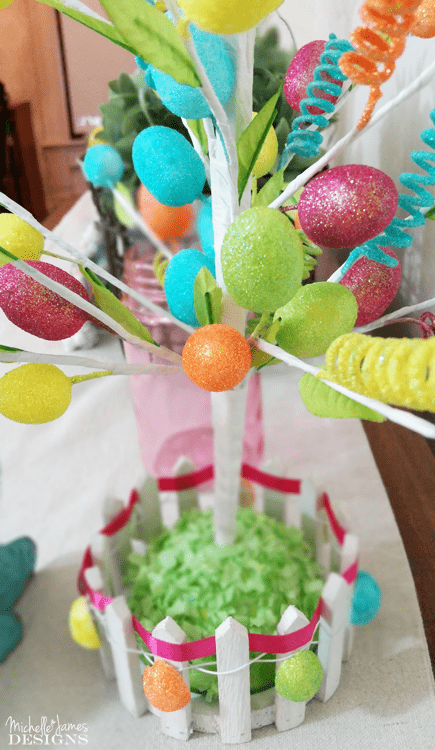 I remember one of my babysitters helped us make a tree for Easter. We sprayed the branches but I think we tied some sort of eggs to them. I remember having a great time doing it but I was really young. Thanks so much for bringing back a fond memory of mine. I love that. This is so cute!!! Will you come and make me one! Thank you Julie! I will be right over. LOL! I am glad you like. I think it is pretty fun and festive.